Kerala Lottery Result-Thiruvonam Bumper 2017 BR 57 Lottery Result 22/09/2017: Thiruvonam Bumper 2017 Lottery BR-57th Draw Result held on 22-9-2017 (Friday). Today’s Kerala lottery result published. Kerala lottery result September 22, 2017. Those who are waiting for the ‘THIRUVONAM BUMPER 2017’ BR-57th Kerala lottery result can now check the online lottery result here. The sale of Thiruvonam Bumper 2017 Lottery started soon after the draw of Monsoon Bumper 2017 on 19/07/2017. The result of Kerala Lottery "Thiruvonam Bumper-2017" is expected to be released by 3:30 PM. 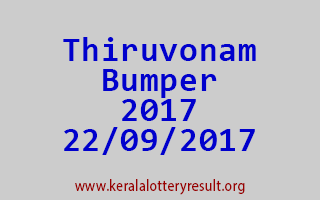 For Printing Official Thiruvonam Bumper 2017 Lottery BR 57 Result 22/09/2017 in PDF file: http://103.251.43.52/lottery/reports/draw/tmp57024.pdf.